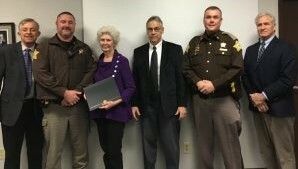 (COLUMBUS) - The Bartholomew County Sheriff's Office received a $10,000 donation to go toward the purchase of a new K9. The donation, from Emmylou and John Wischmeier, will help fund a replacement for police dog Bolt, who retired last month with his handler, Sgt. Kris Weisner. The Sheriff's Department is slated to send a deputy to K9 training in March and should have two K9s on the street sometime in May. Sheriff Matt Myers says the goal of the department is to have three K9 units in the county.